Poll: What should I do with Drowned? you have the right to have access the source code of the mod. you have the right to be able to edit/use parts (or all) of the source code provided that you provide proper credit to the original authour(s). you have the right to distribute the source code and/or compiled versions of the source code. you have the right to use this mod in Lets Plays/YouTube videos however you see fit (monetization, for fun, etc) as long as you provide credit to the original authour(s)(a link back to this thread for example). "GraveStone mod" is an open source mod and released under the LGPL v3, that means you have the right to include this mod in your modpack. 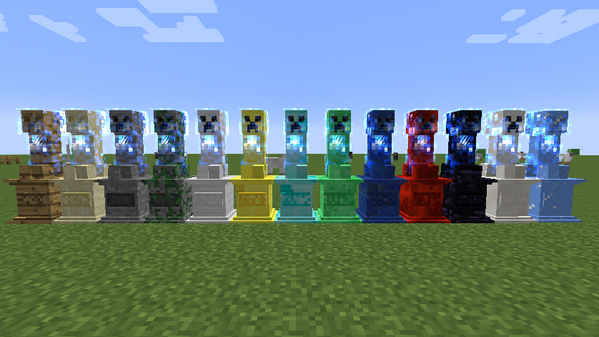 All source code of "GraveStone mod - Graves", "Gravestone mod - Extended" and its "API" available at GitHub. Come join me on Discord! It is compatible with Forge, just tested. I play Slave Hack, give it a try! The mod is updated to v1.1.0. From now it spawns Zombies and Skeletons at night. I've been looking for something like this, thank you so much! Added generation of cemeteries in some villages. P.S. how change topic title ? Quick question, I have a crap ton of mods installed, but are there any incompatibilities you know of? I don't know any incompabilities, and i think it should not be. It doesn't modify any game classes. Thank you for your advice, it realy were some mistakes and inaccuracies in it. But i still have one question: how can i modify topic title and tags? To my shame i can not find any edit links. Unfortunatly there is no changes in it yet. downloaded and tried it. but get a missing texture where the gravestone should be. but it did pop up. was using minecraft default texture.just an fyi. amusing mod though will be a keeper. Is there someone with the same problem? might want to consider an option for the gravestone to function as a death chest, storing all your items (and another option would be experience) upon death. breaking the gravestone would drop the content onto the floor. you could also make a small mini boss that gets spawned from the gravestone when you try to go near it, you could see it as your undead body protecting it's items and experience. Thank you for your advice. It is rather interesting and I'l think about it. But what about "mini boss": there is exist a some kind of defence for it now. This is a spawning monsters. This is may by rather easy at day time, because they spawn only at night, but if gravestone placed some where in caverns it can create a bulk of monsters, by that time when you come. In any case, if you want some "bosses", now I'm working at a "Wither's catacombs". It will be a some kind of stronghold structure, in the end of wich will be spawn Wither. I meant a miniboss for if you decide to make the gravestone act like a death chest. it'd basically spawn 1 zombie that's a bit stronger then the others, maybe also a bit bigger or meaner looking. that zombie would represent your dead body, and it'd be protecting the gravestone holding your items and experience. that miniboss would maybe also be able to summon other mobs to help him. This is an interesting looking mod. I understand that it works with Forge, does it also work in SMP? I like the idea of an option for the stone to act as a type of death chest, that there could be a regular mob that spawns with it. That way it would make it a little more work to get your stuff back, but since it's saved, it wouldn't be that much of a problem to re-outfit yourself in order to go collect your stuff. As for a mini-boss, perhaps that should be only if there is an experience recovery option. Good ideas for a mod. Anyway, it is a good idea, and i'll realize it in a future. May be not the same as you ask, for example "save only small part of items", i can't say exactly now.